With a proven Help Desk ticket classification methodology such as CREATE, companies can Build a Help Desk Ticket category classification scheme that increases ticket trend reporting efficiency, enhance the ticket escalation process, improve reporting, and reduce overall support costs. Every Help Desk needs an ITIL ticket classification scheme to handle the customer’s ITIL ticket type issues when they contact the Help Desk for support. Proper ITIL ticket classification of an issue when a Help Desk ticket is created, enables the Help Desk Agent to sort the issue into support buckets. These help desk ticket category buckets will allow knowledge to be presented to the Help Desk agent when trying to provide proper support, enable proper routing of escalated tickets and allow trend reporting of ticket types. Whether you use Service Now, BMC Remedy, Cherwell or another ticketing system, Build a Help Desk CREATE allows companies to reduce the organization’s support costs by streamlining the Help Desk ticket classification process, quickly identify support trends and focus valuable Information Technology resources on targeted business process improvement with helpdesk categories. Download the “Create Ticket Categories Easily” step-by-step guide now! Collect and export a 6-month sample of Help Desk ticket data. Review the exported ticket data and create a future state ticket classification scheme. Evaluate the proposed ticket classification scheme against production data by applying the proposed classification scheme to the exported ticket data. Adjust the ticket classification scheme to balance the ticket classification categories. Train the stakeholders and staff on how to use the new ticket classification scheme. Execute implementation of the new Help Desk ticket classification scheme into production. A Help Desk industry standard is for every customer contact handled by your Help Desk, a ticket must be created. While your Help Desk ticket classification scheme may be disorganized at this point, your ticket data will hold a wealth of useful data. During the collect phase, you should query your ticket application for 6 months of previous ticket data. CREATE Step 2 Review your exported ticket data and create your future state ticket classification scheme. Review the exported ticket data to find out what is working and where improvements are needed. This includes reviewing the most used and seldom used Help Desk ticket categories. Reviewing ticket data also includes removing ambiguous categories and improve ticket quality. To create the future state ticket classification scheme, it is important to understand how Help Desk ticket categories will truly help meet your business needs. The most common ticket category schemes are by type, by service and by department. CREATE Step 3 Evaluate – Apply the future state classification scheme to the exported ticket data. It’s time to test the proposed classification scheme. This step can be time consuming work but it is very important. By reclassifying the legacy exported ticket data with the future state classification scheme, it will make clear where the gaps are. CREATE Step 4 Adjust your ticket classification scheme to balance the ticket classification categories. Overpopulated classifications – Now is an appropriate time to break up some of the overpopulated “buckets” into smaller and more specific terms. Underpopulated classifications – If you have too many classification terms to select from, it will take longer to classify tickets. Reporting – Setup and run some of the daily, weekly and monthly reports used by the reporting team. CREATE Step 5 Training – Ensure your Help Desk support staff understands the new Help Desk ticket classification scheme. Implementing a new Help Desk ticket classification scheme without properly training the Information Technology support staff would create confusion, inefficiencies and result in implementation problems. Build a Help Desk recommends that Help Desk Agents receive access to a Help Desk application test environment with the new classification structure implemented. This will allow the staff to understand the new structure. CREATE Step 6 Execute – Implement your new Help Desk ticket classification scheme into production. Moving the ticket classification scheme into production, may uncover issues which should be addressed. During the execute step, feedback is critical for continuous improvement. A process must be put in place to allow users the ability to provide feedback. Missing terms – If the users identify a missing term, there should be a formal request for review process to suggest a new term. Classification task time – Help Desk Agents must have ticket classification scheme that is quick and efficient. Initial incident categories focus on what monitoring or the customer sees and experiences as an issue. Capturing incident resolution categories or closure codes allows the incident owner to categorize the incident based on what the end resolution was. This is important since it is based on all of the information learned from recovering the system or how it was fixed. This is can be useful for troubleshooting future incidents. Help Desk Operational categories is a tiered structure that is based on what the customer calling in is experiencing. At the begging of a Help Desk support call an agent may not know the true nature of the incident until they perform troubleshooting steps. An example might be Desktop Software | Microsoft Word | Not starting. Operational Categories will help for initial troubleshooting by the Help Desk and will help with priority and group assignment if it needs to be escalated. Help Desk Operational categories are different then Help Desk Resolution categories. Help Desk Resolution categories are assigned after the incident has been fixed. Our example above may change to Desktop Software | Microsoft Work | reinstalled. I hope this helped. Software | Microsoft Work | reinstalled. I hope this helped. reporting such as availability, incident trends, performance data and such. Thanks so much for this information, it’s really helpful. What if you have a complex environment with multiple enterprise systems along with desktop, telecom, etc. as you have listed, and you want more granular information on the incident type in the categories you’ve listed? Our current help desk product has a three tier structure with data all over the place. Thanks again for publishing these guidelines. Even in a complex environment you still want main level categories but you can add some additional categories such as Desktop -Hardware and Desktop – Software. You must be careful about getting too granular. 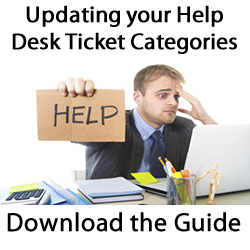 First your help desk agents will take longer creating a ticket and have a higher change of improperly categorizing the ticket. Second you will have some many categories that it will impact trending. An option you may want to use is called product name. With product name you can have a master list of all of your products such as Dream Weaver, Cisco telephone and HP laserjet. One could argue that this is not category, but the type of ticket. True, but this starting point leads to a simplified Tier2 and Tier3 that is intuitive. Consider Project Task where in Tier2, you can list the current projects in the queue. Question could stop at Tier1. Do we need to know the question is hardware or software. Knowing it is a Question puts it on a lower priority vs a Bug. good article, what about the resolution catgories? Are you going to write something about the resolution code/catgories?